iPad and iPhone owners have had it pretty much their own way when it comes to DJ apps. However the times they are a-changing, as Mixvibes continue their David and Goliath charge to be in there up amongst the big boys with their new Cross DJ for Android devices. 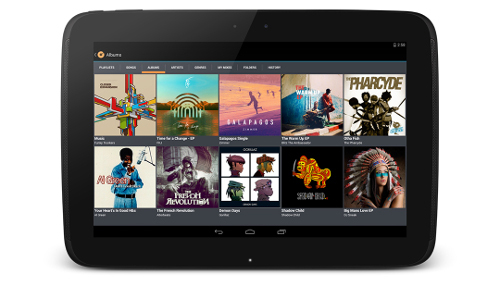 Billed as the first pro DJing app for the Android platform, Cross DJ comes as an eagerly-awaited and anticipated release. For our testing purposes we loaded it up onto the HTC One, to really see if we could take the party to the streets with this happy combo. The HTC One is basically the Android version of the iPhone. Some would say it's more apt for music because of one simplistic-but-clever design feature — and that is to put the speakers at each end and on the front of the phone. Not the back but the front, the same way as setting up any hi-fi listening system. The other ace in the pack is the fact that the sound engine on the HTC One has been tuned by Beats and uses a separate chip to power the sound, meaning that just on the phone's inbuilt speakers alone this little thing sounds far better than any of its rivals. So down to the task in hand. The HTC One coupled with Mixvibes cross DJ is the perfect combination for a spot of impromptu DJ entertainment. The graphic interface of Cross DJ is pure simplicity, just the way it should be; however it holds a lot of feature-rich elements that can be delved into, which really start to make this app a cool piece of work. Now if DJ Mag's sounding like Mixvibes has reinvented the wheel then you'd be right, as other DJ apps for the Android system definitely fall short and haven't really offered users anything tangible to operate in a professional environment, meaning that Cross DJ is a welcome addition. So how does it work? Simply choose a track from a stored library, let Cross DJ do some behind-the-scenes magic analysis and the track will be BPM ready — handy for the auto sync function that enables ultra-smooth mixing and mix transitions. Of course, this feature can be turned off, so DJs can opt to use their well practiced mixing skills, but when it comes to apps like these auto BPM detection and syncing is the way to go, as it frees the user up to be able to employ loop, EQ and FX features, which Cross DJ implements very well. Once again the emphasis being on simple and easy modes of use. Once the tracks of choice have been loaded, by tapping on the turntable graphics or the song markers at the top of the screen, users are ready to go. Cross DJ is set up like the traditional and conventional DJ set-up: two decks and a central mixer with a cross-fader making up the main viewing screen with cue, play and sync buttons under each deck section. At the top of the viewing screen is the linear track graphic that expands to show detailed audio waveform graphics when the DJ starts manipulating the jog-wheels, incidentally of which, the feel is so responsive, accurate and sharp that scratching and other turntable wizardry can easily be performed. In the middle of the view screen are the VU meters that show an accurate representation of how loud the audio is. Above this are three mode buttons: one for the looper and slip mode functions; the second for more detailed volume control and EQ features (of which each deck has the usual low, mid and hi frequency controls); the third button is for the FX section which opens up the FX view screen and two XY pads for each deck. DJs can scrub their fingers over the pads to initiate the actual effect, while there are two effect modes, locked and free. In locked, the FX can be locked so when a finger is lifted, the effect will remain in the last position, whilst in free mode, when a finger is removed, the effect will return to its initial starting point. There are currently 15 different FX types that can be chosen by the user. There is an advance settings buttons for fine-tuning of the Cross DJ app, output modes, master gains, support and tutorials, which shows DJs how to use the app as they play with it — a cool learning function. 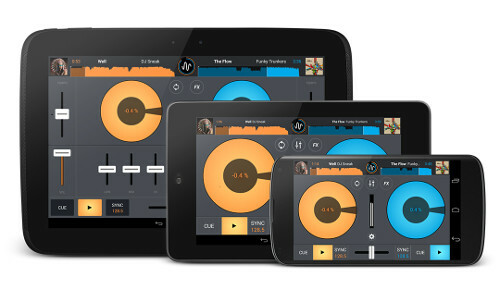 Mixvibes Cross DJ app for Android is a true bit of digital DJing software that bridges the gap on other apps that are widely available for iPad and iOS users.